A jumble of styrofoam skulls in Endless Basket is the appropriate holiday merchandising approach. 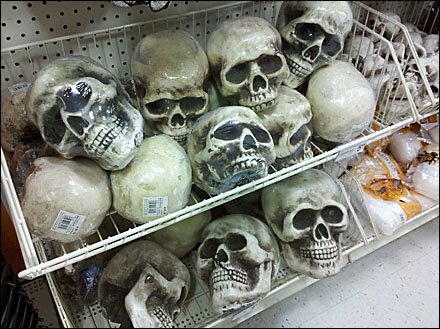 Neatly ordered rows aligned along the shelf would violate one’s expectations for skulls, unless specifically browsing catacombs. And hanging from hooks is a technique surely reserved only for shrunken heads. SEARCH: “Endless Basket” or “Silly” for more.